The world in which you live is not the world you think it is. In fact we live in a world in which Werewolves, Vampires, Shape-shifters, and Elven live among us. Very few humans actually know of their existence thanks to a select few known as Keepers. Keepers are a group of select individuals who are born into their positions; enforcers of the the laws of "The Others" and sworn to keep the peace between all the races. Unfortunately for Rhiannon Gryffald, she and her cousins Barrie (a journalist) and Sailor (an up and coming actress), they have been forced into their positions years before they thought they would due to their Fathers' being called to the "high council" - in Hollywood California no less. And just Rhiannon 's luck, a string of murders have occurred just prior to her arrival - murders that mimic a vampire attack. With little choice, Rhiannon teams up with Brodie McKay - a detecting AND an Elven, where together they uncover a plot that may forever upset the delicate balance between humans and the others. I found this book to be a bit lacking. We are suddenly thrown into the world of Keepers without knowing much about them. I would have loved to have seen more background information on the Fathers (the original Keepers). Granted, this is the first book in a spin-off trilogy, but it was meant to be a stand alone novel, so that doesn't excuse the lack of information provided. A lot of the characters seemed very one dimensional, I wish the author had spent more time developing them as I absolutely loved the premise - a string of murders apparently caused by a vampire? However, the writing felt like it was geared more towards a young adult audience (with the exception of the few minor love scenes). It took me several days to finish this book as I found it very easy (until the plot really got going - about 1/2 way through) to put it down and walk away. Keeper of the Night (The Keepers: L.A. #1) is available for purchase from Amazon.com by clicking HERE. 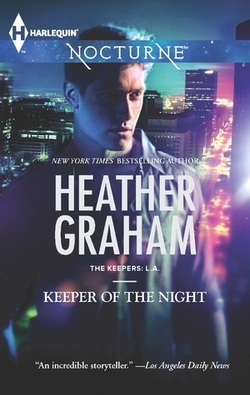 DISCLAIMER: I received an advanced copy of Keeper of the Night (The Keepers: L.A. #1) in exchange for my honest review. This has not reflected on my review in any way.